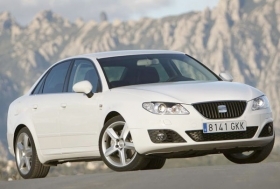 Seat's Exeo is key to boosting model mix. BARCELONA -- Volkswagen's Spanish subsidiary Seat hopes that new product launches in the coming years will make it less reliant on the Ibiza subcompact. "We have to lower our reliance on the Ibiza," Jan-Henrik Lafrentz, Seat's vice president sales, told Automotive News Europe. The Ibiza, which celebrates its 25th anniversary this year, accounted for about half of Seat's 368,000 sales last year, Lafrentz said during an interview at the Barcelona auto show. Because of popular scrapping incentives in many European countries, the Ibiza accounted for about 60 percent of Seat's sales during the first four months of 2009, Lafrentz said. Seat's European sales were down 22 percent in the first four months of 2009, to 102,983 units, according to data from the European auto manufacturers association, ACEA. The Spanish brand is seeing strong growth for the Ibiza in Germany and France, where scrapping incentives are encouraging car buyers to downsize, Lafrentz said. Seat is suffering in its home market, which traditionally represents a little more than 25 percent of its total sales, and the U.K., where scrapping incentives have yet to kick in. "In the long run, we need a better mix," Lafrentz said. Over the coming three to five years, Seat hopes to see the Ibiza fall to about 30 percent to 40 percent of total sales. The compact Leon should represent another 30 percent to to 40 percent, with the remainder split among remaining models, Lafrentz said. During the Barcelona auto show, Seat revealed the sporty Cupra version of the Leon and the planned station wagon version of the mid-sized Exeo sedan. Both cars are key elements of Seat plans to lower reliance on the Ibiza. "With the new Leon and the Exeo we should have more sales pillars to rely on," Lafrentz said. The range will grow by one car annually starting in 2010. "Every year we are going to have one major product launch," Lafrentz said. "We have to define our priorities, because we know we can't do everything all at once."